[dropcap]Y[/dropcap]ou’ll never mistake Venum Wave boxing gloves for just another ordinary pair. These gloves are edgy and distinct—a testament to the design team at Venum. 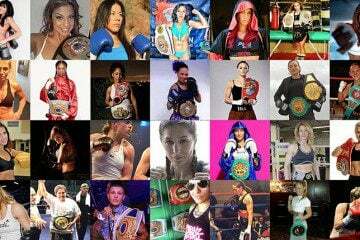 Venum is a premium manufacturer and retailer of MMA gear and clothing. Brazilian Jujitsu competitors originally started the company in 2006, and now it’s grown into one of the most popular providers of combat sporting goods in the world. You can find everything from boxing gloves to rashguards at Venum. Over the past few years, the company has become the sponsor of some of the most elite fighters in Mixed Martial Arts. You’ll find Venum boxing gloves protecting the hands of Lyoto Machida, Carlos Condit, Fabricio Werdum, Wanderlei Silva, and many more legends of the cage. Venum Wave boxing gloves have a reputation for being comfortable, stylish and providing excellent protection for your hands. The first thing you’ll notice is the distinct design on the outside of the leather—something that Venum has become famous for. These gloves have the “Brazilian Snake” logo on the outside of the gloves, surrounded by a wave pattern. With triple-density foam, a reinforced palm and an extra large Velcro enclosure for security, you’ll see why so many fighters choose these gloves. The Venum Wave boxing gloves feature 100% high quality natural leather. When you try them on, you’ll notice right away that the material is of a higher grade than many other gloves on the market. As you know, boxing gloves provide support for your wrist and protect your hands from damage. They also reduce the incidence of cuts when you are sparring. That’s one reason why the material that your gloves are made of is so important. These gloves are also designed for maximum shock absorption. The triple-density foam actually provides you with three different layers of excellent protection. One of the things you’ll notice is that these gloves feel very snug. They don’t have the same “awkward” or “heavy” build that some gloves have. This gives you a maximum amount of comfort and allows you to achieve better results from your training sessions. One of the elements that set Venum products apart from other MMA gear suppliers is the quality of the product. These gloves are a testament to this high standard of glove production. The gloves are practically seamless and you’ll be able to tell the difference from the very first day that you slide them over your hands. The quality is better than many other gloves on the market. Some boxing gloves will begin to break down at the various stress points after you have been using them for a time, but these gloves are much more durable. Even after thousands of punches, these gloves continue to hold up. Most people don’t know this, but Venum boxing gloves are the product of years of research by a highly specialized development team located in Thailand—a prime location for building and testing the best boxing gloves. 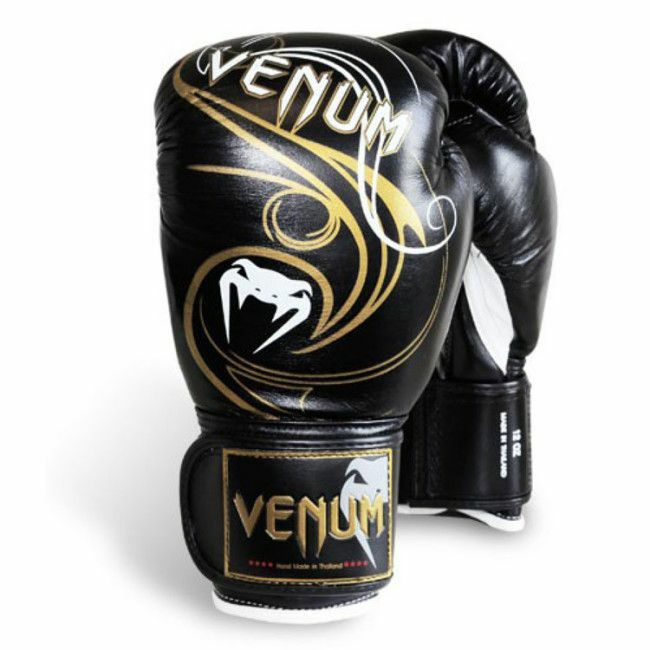 When it comes to style, the Venum Wave boxing gloves may best be described as “striking”. They feature elegant wave patterns across the knuckles and the back of the hand and the patented “Brazilian Snake” that has become a symbol for excellence in MMA gear. The wrist straps have an embossed, 3D touch logo that also features the “Brazilian Snake” design. These gloves also have a 100% fully attached thumb and a reinforced palm for Muay Thai and other styles of kickboxing. I found that the large Velco straps provide maximum support without sacrificing comfort. For the best results, you should choose 16 oz gloves when you’re sparring with Venum Wave gloves. This will protect both you and your partner from injury. If you plan on working the bags with these gloves, then you should choose the weight that corresponds with your body size. Not a good choice if you like plain, solid color designs. It’s absolutely important that you choose the right glove to protect your hands when you’re working the bags or sparring with your partner. I can’t count how many times I’ve borrowed someone’s lower quality gloves during class and regretted it. Lesser quality gloves will typically feel awkward and not protect your hands as well. Try Venum Wave boxing gloves if you want to take your MMA or boxing training to the next level!